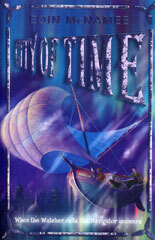 Sequel to The Navigator, and another urgent battle to prevent the Harsh from seizing control of time itself. Cati has taken over from her father as the Watcher. While the rest of her people, the Resistors, sleep in the Starry, she watches from the shadows of time and waits for the next attack. 'Hello, Watcher!' Owen shouted as he always did, knowing she could see him even though he couldn't see her. He paused and scanned the shadows under the trees, wondering if she was safe and if he would ever see her again. Time, he had learned, was a dangerous place. 'It'll hit us?' Cati said, staring at the moon as if she'd never seen it before. If the fabric of time is threatened it's Cati's job to wake the Resistors, but this time she finds she can't do it. Something is wrong in the Starry. The air is foetid and the sleepers are disturbed. The only person she can turn to is Owen, the Navigator. He lives in the ordinary world but he has a role to play in Cati's world too, like his father before him. The only problem with that is that neither Owen nor Cati are quite clear what Owen's role is. Both children have lost their fathers too early for the knowledge to be passed on. 'What is a tempod?' Cati asked, thinking about the final odd word of her father's message. Pretty handy. But not easy to come by. If you fancy a rollicking, fantastical adventure, this one could be for you!